For almost thirty years, award-winning author and adventurer Lyn Hancock kept a special story close to her heart. At last, she is ready to tell it: the remarkable tale of an animal whose saucy personality enlivened Lyn’s days and brought joy and wonder to the lives of countless people. At three weeks, Tabasco is a tiny, helpless ball of fluff. Already, the little raccoon’s life is unusual: tucked into Lyn’s pocket or tote bag, Tabasco accompanies Lyn on a cross-country tour, making friends every step of the way. By the time they get home, Tabasco is ready to explore the world-inch by exciting, fragrant, tactile inch. Nothing is safe from Tabasco’s clever paws. Dogs run and horses stand still when Tabasco comes to call. Children flock from all around to play with Lyn’s busy, talkative friend. Much as Lyn loves Tabasco, she knows that raccoons are wild creatures, not house pets. 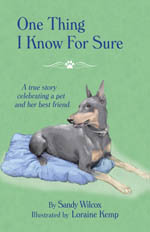 The story of Lyn Hancock’s search for a new, wild home for her beloved companion will melt your heart. 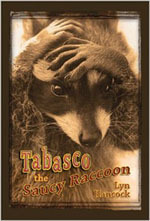 Young and old alike will treasure the unforgettable tale of Tabasco, the saucy raccoon.